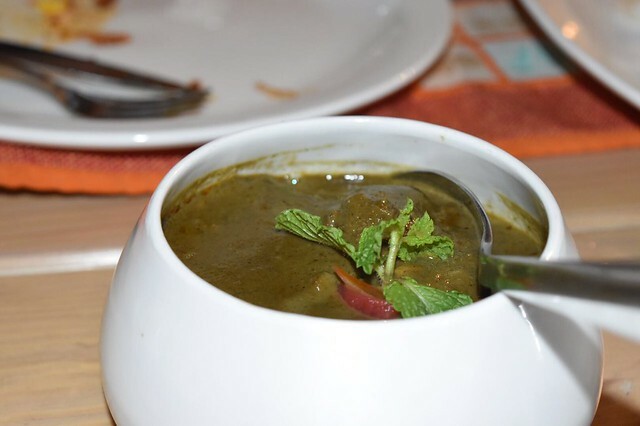 It’s a rarity to see that a restaurant opens its door in an unknown terrain (read North India) and experiment with its local tastes. 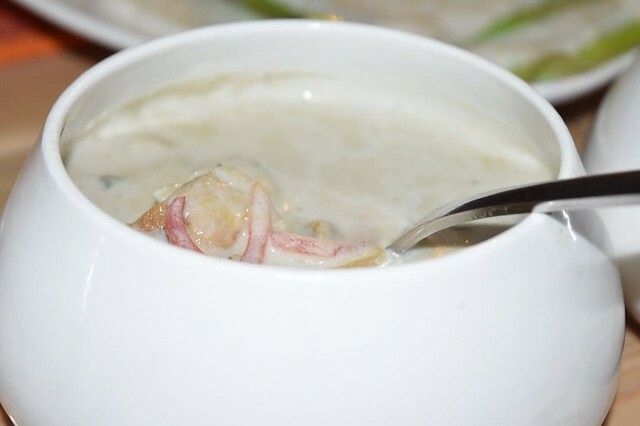 Peninsular Kitchen, as the name suggests dishes out coastal delicacies from few of the Indian peninsular states – Maharashtra, Goa, Kerala, Tamil Nadu, Andhra Pradesh and Karnataka. Located in the food hub – Ambience Mall, Vasant Kunj, the place is done up in hues of blue and orange giving you a feel of the coasts. Walls are adorned with motifs of anchors, chilies and fish. The staff is attentive and vigilant. The menu is extensive, so we were suggested to go by the set menu. 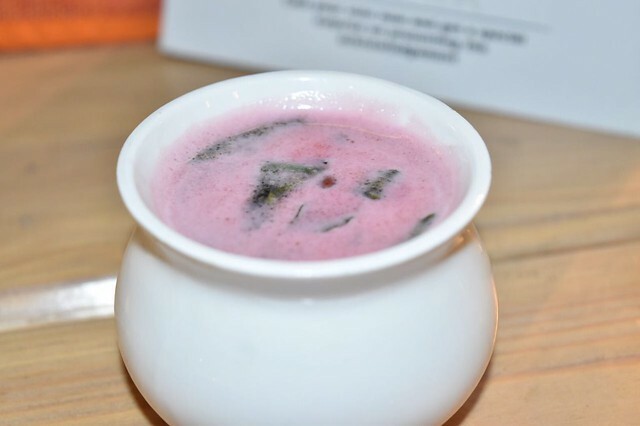 The course started with a refreshingly cool Sol Kadhi – one of the best I have had and a bowl full of papads with an assortment of chutneys – tomato, mint, raw mango (must try) & coconut. Freshly grounded and flavorful, the chutneys got me going for the papads over & over again. Coconut Pinacolada – coconut fizzed water with pieces of coconut, mint and lime was delectably uplifting. 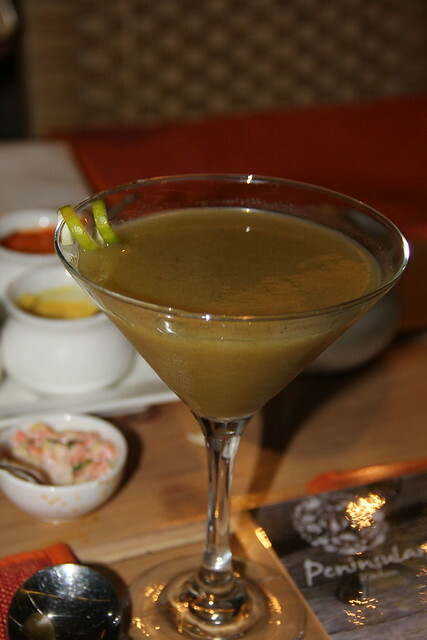 Ambitini is a drink apt for the season – a concoction of aam panna and rum – very refreshing whereas Khattalicious is the bartenders take on the kala-khatta chuski – the street side love, only a bit too sweet – a little more citrus flavor in there, and it will be a rock star! 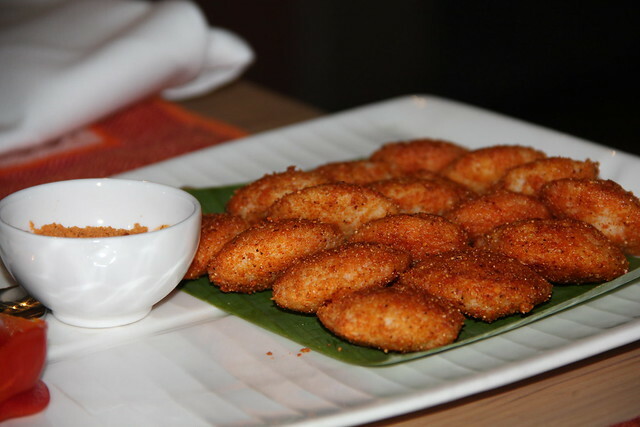 Kerala stir fried Prawns, gongura chicken fry, khatti macchli, maddur vadai, mini idlis tossed in podi made rounds as appetizers – idlis – soft with the right amount of gun powder; gongura chicken fry – one of the highlights, well cooked and the spice level maintained as per the actual recipe; kerala stir fried prawns were delicious with mustard seeds, curry leaves and coconut masala paste but a bit spicy for my buds; maddur vadai – a dish from Karnataka was a little dry and hard for my taste but others enjoyed it. 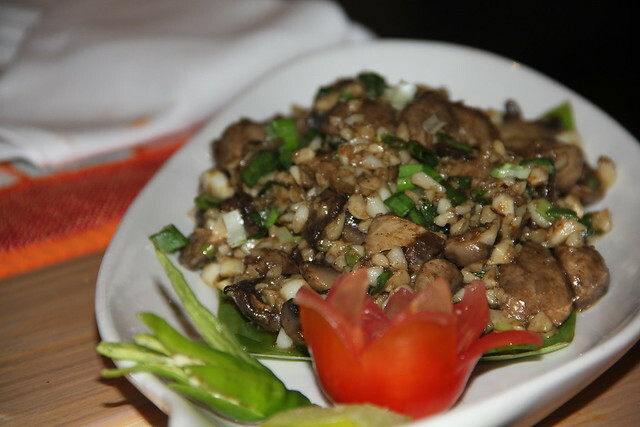 Butter Pepper Garlic Mushroom is a brilliant vegetarian adaption of the otherwise prominently seafood flavor. The main course of chicken chettinad and mutton stew were served with appams and malabar paratha. 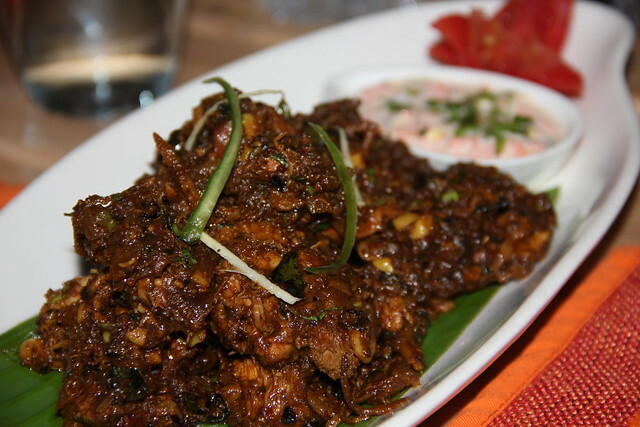 Mutton stew is out of this world and chicken chettinad is ideal – packed with the punch of the spices, complimented by the appams and paranthas. Kerala Fish Curry paired very well with thered rice. 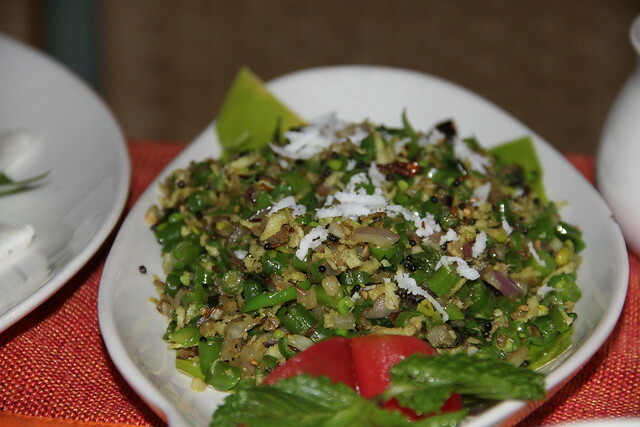 Beans Poriyal stands out – the crunchiness combined with the flavors. 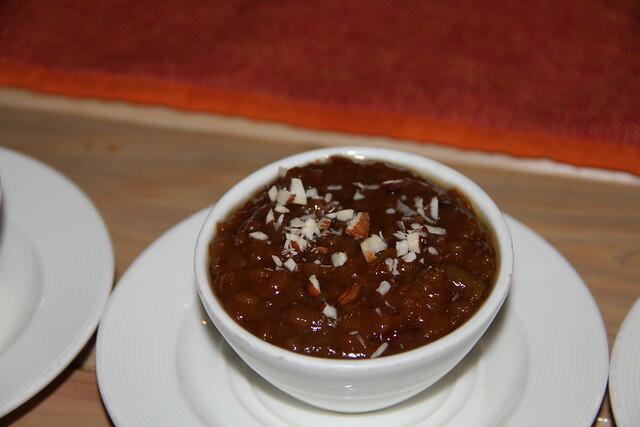 With all those spices playing the devil with the palate, aravana payasam and pineapple halwa came to the rescue. 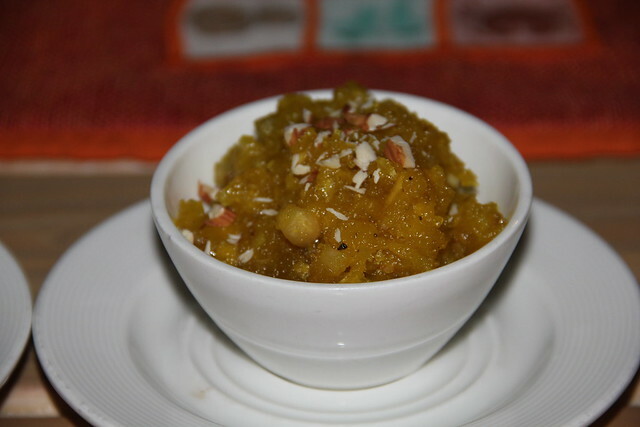 Pineapple Halwa was clearly a winner here – very unique and balanced and is a must try.